High quality sticker that is UV stabilized so it doesn't fade, also uses high quality adhesive to stay stuck! 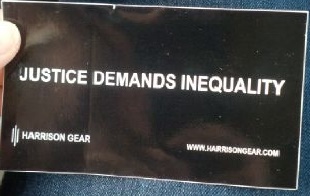 Reads "JUSTICE DEMANDS INEQUALITY" and we hope that these will incite some good conversations. The reality is that wage equality and such are simply not just. Until every American is equally as hard working, equally as smart, equally as talented, equally as motivated, etc. we don't all deserve equal pay among other things.